I have started on my yearly internet fast, which gets more difficult each year due to the insane amount of time we are supposed to spend on the computer. School, social, and organizations duties keep me checking at the very least, email once a day. Learning to be alone is a process but an important one and it is what my journey in Montana is all about. I want to learn who I am and I do my best to create space for my soul and heart to do that. Since Yule I have been continuing my tobacco offerings. Although they are small and have been placed on my altar indoors since my return to Montana. 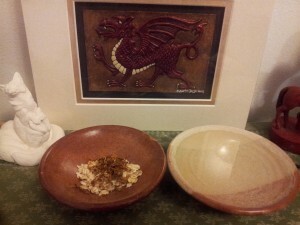 Tobacco, oats and water at the feet of my laughing fox and welsh dragon. I went to see an energy healer as part of my requirements for a course I am taking in school called, Energetics. It looks at the body’s subtle system and teaches us about the energy centers in the body and how knowing about this can help us as massage therapist. If it does anything, you do feel loved and cared for after receiving work and I feel this is positive. I happened to see my instructor for this required session and was quite surprised at what I experienced. When she placed her hands over the chakras i felt a very strong movement, as she moved towards my head the feeling go stronger, like I was in water and being turned around faster and faster. It took some time and lots of breathing on my part to settle myself. I felt very hot and almost drunk, like that warm, relaxation that washed over you after a couple of drinks. ” Your energy centers are very clear and powerful. There is no stagnation in your your life. When you decide to do something it gets done! Your first chakra is the seat of passion and man, do you ever have one. I almost feel bad for people in your way! That wave of strength flowing over them must be mind-blowing. Such Passionate power moves mountains. but sometimes you are afraid of it. It’s misinterpreted and people think you are egotistical, mean or rude. You are just doing what you are meant to do! Many of your past lives in the last 300 years have had you at the forefront of battle. You’ve fought for equality and fairness, even at the expense of your life and ceaselessly.Sometimes you’ve been on the side of good, and sometimes not-so-good (but this was done to gain understanding! You wanted to really know how your adversaries felt) . You are not afraid. This life seems to be summing up all the others, using your power to make peace, instead of bring the lessons of battle down on the heads of the unenlightened. The angels are with you but are not involved with this life because, well you’re doing fine on your own. 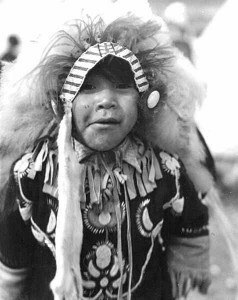 I don’t see many guardians but one that stood out is a 5 year old First Nations( Native American) boy. He is just holding your hand. When I asked if he wanted to say anything he just kind of shrugged and indicated he was where he needed to be. I’ve never seen a child guardian before. I was grateful( and tired) the rest of the day. I went to my first Aikido class this week and was reminded of the deer medicine that came during winter break. Approaching the mat with a deer mindset made my hour of practice ( really just rolls and breakfalls!) much easier. Although I experienced the joys of muscle fatigue anyway! I am very happy for the opportunity to live these lessons, emotionally and physically.